Amazing pictures of Pokhara's Davis Falls locally known as Patale Chhango (Hell's Fall). We are continuing our tour of Pokhara in Nepal, a bustling tourist city in the foothill of the Himalayan massif - Annapurna. A breathtaking example of that geological phenomenon is the Pardi Khola river that about 2 km south from its source in Phewa Tal suddenly plunges 30 meters down (100 ft) over the Patale Chhango (Hell’s Fall). It re-emerges after about 500m (1620 ft) of an underground flow joining the Phusre Khola. The waterfall is also known by the name Davis Falls – a name, sad to say, having the tragic origins. The story has it that in an early afternoon on a sunny July 31st in 1961, the sudden flood from the Phewa Lake swept-away a Swiss citizen Mrs. Davis having bath in the waters of Pardi Khola river. Amazing shapes of the Davis Falls - Pokhara. Sculptor’s hand wouldn’t make it more fascinating. One can only imagine the power of water being able to shape this landscape carving so amazing structures, holes, tunnels, narrow passages, bridges…. Locally known as Patale Chhango (Hell's Fall)it is also known as Davis Falls. On the right - It all starts here in the Phewa Tal (Lake) draining to the Pardi Khola river …. Apparently the lake’s floodgates were opened without warning taking by a terrifying surprise those down the river. Since then the fall took the new name – Davis Falls (sometimes referred to as Devi’s Falls) commemorating this tragic and deadly event. If you prefer however to live this experience in person, keep in mind that you have to be here in the low-rain season to fully appreciate the beauty of the erosion. During the rainy season (especially the time of monsoon) the Pardi Khola river swells to gigantic proportions. It certainly magnifies the waterfall’s effects but also deprives you from seeing the picturesque forms and shapes fully submerged under the fast moving water. 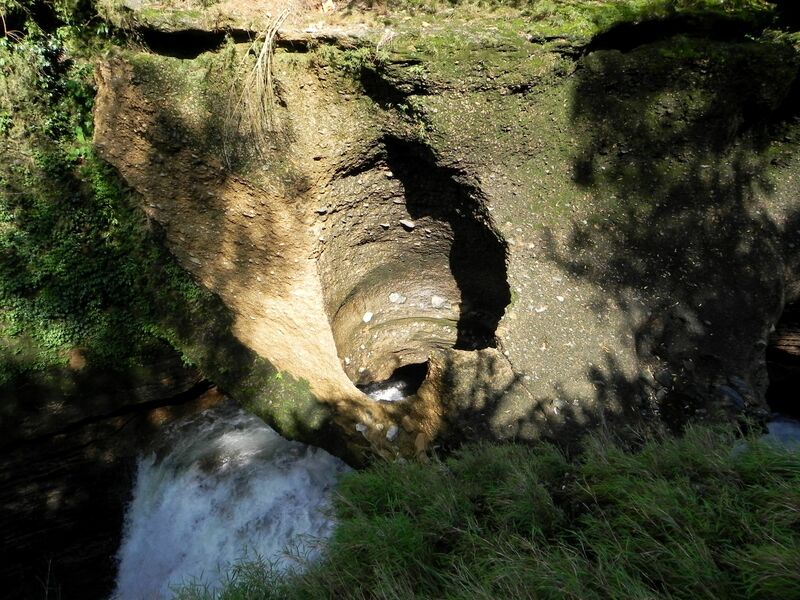 The stretch of the river leading to the sink-hole is a magnificent example of the nature’s hand work. Water-shaped forms exceed the imagination, twisted gorge, donut-like perforations in the water bedrock, here and there overhangs… well, welcome to the Free Pokhara Nepal Pictures to feel the atmosphere hanging there in the air.